In the press conference just over two weeks ago where Kevin Payne was relieved of his duties at TFC, overshadowed by Tim Leiweke admitting the club is looking to Italy for a potential designated player, was where he mentioned the club needs to be properly developed through four building points: the academy, the draft, trading within MLS, and the designated players. This was further reinforced last week upon Payne’s replacement Tim Bezbatchenko echoing these sentiments of how Toronto will need to move forward. I agree with Leiweke and Bezbatchenko on how to achieve a successful club within MLS, both within the league structure and on the pitch, and I also agree there are four building blocks, although I feel Leiweke’s original analysis is too simple. 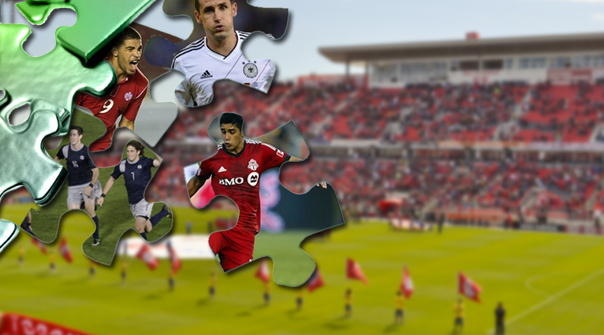 My view of the four building blocks deal with the league’s salary cap and a further step in properly developing an MLS club is understanding the value of each player based on salary expectations. Currently MLS salary cap basic rules is a team roster can be made up of 30 players. However, players in the first 20 roster spots count against the league cap of $2.95 million, not counting extra salary of designated players. Designated players count $150,000 against the cap for players under the age of 20, $200,000 for players between the age of 21 and 23 and a league max of $368,750. Players listed as 21 to 30 on the roster and are referred as off-budget players and include Generation Adidas players, Homegrown players and players at minimum salary contracts. There has been plenty of debate if a salary cap actually exists in MLS or if even the salary numbers the union provides are actually how much players are being paid. Even if the salary cap isn't the same from what we expect in sports, such as the National Hockey League, the league does control how much each player makes, so they can control how much each team spends. With MLS liking the idea of parity they do keep a tight ship regarding salaries, and all teams are currently in the range of $2.6M and $3M, except Chivas USA who are at $2.2M. For me, player salaries are still a great valuation for MLS team development. In my view, the four building blocks of MLS development are based on a salaries range: those who don't count against the cap, players in lower salary range, players at high salary range and finally players who are at the max, including DPs. It’s managing all of these players within the $2.95 million salary cap and taking into account all the circumstances during the regular season such as injuries, loss of form and realizing the potential loss of better players during internationals, that is the challenge towards making the playoffs while also having a strong starting eleven that could win you a MLS Cup finals. I believe that all players need to provide some value to the club. Having players on the roster who the manager will not play is a waste of money and resources and if this is the case the players should be released, traded, or as mentioned in my last article, loaned out to clubs in USL Pro or the NASL. This being said, I understand salaries reflect the player’s value and you shouldn't expect a player at a minimal salary to compete for minutes with a player who is on a higher range of salary. One solution in dealing with this is a system that has become popular in Europe, from managers such as Jose Mourinho, is basically making the squad into two teams so each position has a starter and a backup player who can be used as a direct replacement. One of the ways of establishing this system is having a set agenda on how you expect you team to play. For example, if you wish the club to play a traditional 4-4-2 with a English style big/small player up front, the squad has to make sure it has the reserves who can also play this system. Likewise, if the club wishes to play a more modern system of 4-2-3-1, the club must make sure they have enough defensive midfielders who can be slotted in. This brings up an additional concern with MLS academy-based players, as players have tended to be signed based on skill levels opposed to position, so some clubs have had difficulty integrating these homegrown talents into their lineups. Once a club has established a system and their needs, the next step is selecting the best available players for these positions and structure them within the salary cap restrictions. As Leiweke mentioned, academy players and drafting can give you a great advantage based on the quality of your homegrown players (academy) and drafting players who are part of the generation Adidas program. A great example of this is New England Revolution’s current rebuild where generation Adidas players Kelyn Rowe and Andrew Ferrell, while homegrown players Scott Caldwell and Diego Fagundez, have all played valuable starters minutes with none of them counting against the Revolution salary cap. This has allowed them to add players such as Juan Agudelo, José Gonçalves and most recently Charlie Davies, and has lead the team to already gaining more points than last season and are in contention for a playoffs spot. Probably the next step is understanding the role in the side of the DPs and working the rest of club around this decision. The concern of the DP is two-fold: number one making sure the performance of the DP is dramatically better than an MLS alternative in that position, and once signed getting the most out of the player to benefit the team. This is one of the reasons why I don't think the DP needs to be an all out goalscorer or a flashy player as cap-wise you can get as much value in a keeper, defender or defensive midfielder. However, if you go in this direction you have to be willing to budget other players around the DP's accordingly. Same goes for an offensive DP, as one of the biggest mistakes MLS clubs have made is assuming the DP will control most of the offense and if he doesn't perform or is unavailable the team is heavily jeopardized based on the clubs chosen alternatives. In terms of other players, the most important aspect is recruitment either through gaining players with MLS experience or bringing in foreign players. Although there is a big difference in salary cap from under $100,000 to over $200,000 it isn't always the case in terms of performance. Toronto FC is a good example of this with players such as Steven Caldwell, Joe Bendik, Jonathan Osario, Jeremy Hall, and Reggie Lambe making under $90,000, while players such as Stefen Frei, Alvaro Rey, Jeremy Brockie and Richard Eckersley are/were making close to or over $200,000. This also provides some warning to the GA/HGP system as eventually these players will no longer be at that status and maybe too expensive based on value like Frei has been this season. The other issue with high priced players is their value to other clubs as most teams will realize these players are not worth what they are being paid, so during a rebuilding phase you will not able to trade these players for valuable commodities. Though not all players above $200,000, but below a DP level, are a rip-off as players such as Brad Davis, Kyle Beckerman, Will Johnson and Alessandro Nesta are all paid over $200,000 but have both a proven track record and have become key player in their clubs’ tactical system by design or development. The final steps are filling out the roster with the left over cap room where you can follow the method like Colorado and Houston have done and ignore the high priced players and have players at most positions around the $150,000 range. Or you can do what the LA Galaxy and Seattle Sounders have done by having a large number of high priced players and filling the roster with minimum salary players that you can recruit from seniors in the draft, players at the USL Pro and NASL level. I believe player analysis can be examined through a variety of statistics and a mix can be created based on expected return in each position. Two seasons ago I analyzed all the players available in the the Montreal Impact expansion draft from a variety talent and compensation. The players who performed the best in terms of value in this analysis such as Seth Sinovic, Sanna Nyassi and Lamar Neagle have also proven to be a valuable commodity in MLS. The main point in analyzing any player acquisition is, is the player worth the salary you are willing to give him? Which in Toronto FC’s case brings up questions: was it worth drafting Kyle Bekker at $72,500 against the cap over a GA's Deshorn Brown and Walker Zimmerman? Or trading a top draft pick for Eric Hassli to make one final shot at a playoff run? It can be argued these moves were done to generate good press, when the reality is all analysis should be done for one reason only - making sure the team is better on the pitch.